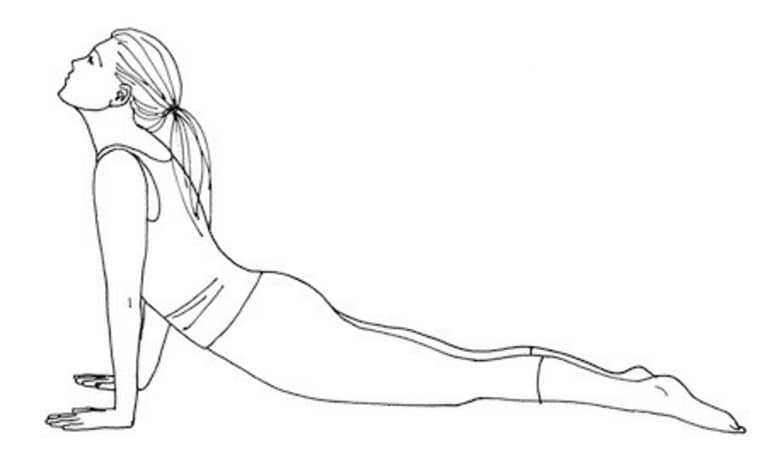 A workout I love for enhancing flexibility is the Five Tibetan Rites, also known as the “Fountain of Youth”. I first came to know about the Tibetan Rites through a family friend who at the age of 60 still has amazing flexibility (doing handstands and all sorts of things), health and energy and I must add doesn’t look a day over 40 (with no grey hairs!). She shared this was her secret and told me to look up the rites on youtube. So I did and tried them myslef and have been enjoying the amazing benefits ever since. Firstly what are they? They are said to be an ancient series of exersises (over 2500 years) old used by Tibetan monks for a vibrant, longer, healthier life. I recommend doing the rites in the morning rather than the evening, because they do increase your energy. Begin by practicing three to seven repetitions of each rite, and build up to 21 reps. Never push yourself to exhaustion. Precautions: Start slowly if you have not been practicing a vigorous exercise or yoga program. If you are overweight or have been inactive for a period, do not do Rites #4 and #5 until you have developed some strength and endurance. Stand with your arms outstretched and horizontal to the floor, palms facing down. Make sure your arms are in line with your shoulders. Your feet should be about hip distance apart. Draw the crown of your head up toward the ceiling. Focus on a spot in front of you so that you can count your rotations. Spin around clockwise until you become a little dizzy. Gradually increase the number of spins from 3 to 21. Breathing: Inhale and exhale deeply as you spin.Tip: If you feel super dizzy, interlace your fingers at your heart and stare at your thumbs. Also have a chair very nearby to grab onto to steady yourself if you feel as if you are going to fall. Lie flat on the floor. Fully extend your arms along your sides and place the palms of your hands against the floor. If you have lower back issues, place your fingers underneath your sacrum. As you inhale, raise your head off the floor, tucking your chin into your chest. Simultaneously lift your legs, knees straight, into a vertical position. If possible, extend your legs over your body toward your head. Then slowly exhale, lowering your legs and head to the floor, keeping your knees straight and your big toes together.Breathing: Breathe in deeply as you lift your head and legs, and exhale as you lower them. Kneel on the floor with your toes curled under. Place your hands on the backs of your thigh muscles. Tuck your chin in toward your chest. Slide your hands down the backs of your thighs as you draw your shoulders back and your head up toward the sky. Keep in mind that you are arching your upper back more than your lower back. Move your head back as if you were drawing a line with your nose on the ceiling. Slowly return to an upright position and repeat.Breathing: Inhale as you arch your spine and exhale as you return to an erect position. Sit down on the floor with your legs straight out in front of you and your feet about 12 inches apart. Place your palms on the floor alongside your sitz bones. As you gently drop your head back, raise your torso so that your knees bend while your arms remain straight. You are basically in a table-top position. Slowly return to your original sitting position. Rest for a few seconds before repeating this rite.Breathing: Breathe in as you rise up into the pose, hold your breath as you tense your muscles, and breathe out fully as you come down. Lie down on your belly with your palms face down. 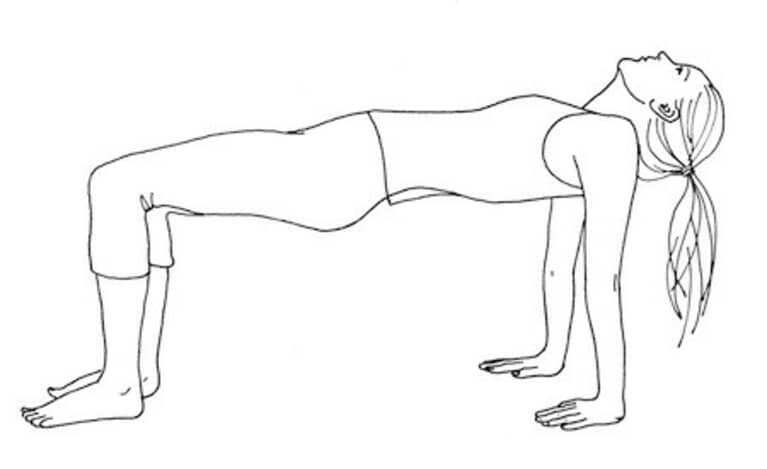 Press up into an upward-facing dog by curling your toes under, lifting your heart, and drawing your shoulders back. Your arms should be straight. Look straight ahead of you, or if you are a little more flexible, gently draw your head back, taking your eyes toward the sky. Then draw your hips up and back, extending your spine, into downward-facing dog pose. Repeat by moving back and forth between downward- and upward-facing dog.Breathing: Breathe in as your rise up into upward-facing dog; breath out as you push back into downward-facing dog. Once finished, come to a neutral position lying on your back in corpse pose, allowing the body to become completely still and calm. Relax in corpse pose for three to five minutes before completing your practice.